Annually, the members of the department vote who they feel best represent the department in a number of categories. The recipients from the in-house awards are then nominated for Morgan County Association of Volunteer Fire Departments awards at the county level. On April 13, 2013 the Priceville Volunteer Fire Department received numerous awards during a ceremony at the Morgan County Association of Volunteer Fire Departments banquet. On April 14, 2012 the Priceville Volunteer Fire Department received numerous awards during a ceremony at the Morgan County Association of Volunteer Fire Departments banquet. If you have a subscription to the Decatur Daily, a full press release can be read HERE. On April 16, 2011 the Priceville Volunteer Fire Department received numerous awards during a ceremony at the Morgan County Association of Volunteer Fire Departments banquet. If you have a subscription to the Decatur Daily, a full press release can be read here. In 2011 the department also recognized several special members who have dedicated 30+ years to the department and the community. A special plaque was awarded to the following members. Thank you, gentlemen, for all you have done to ensure our department continues to do great things! 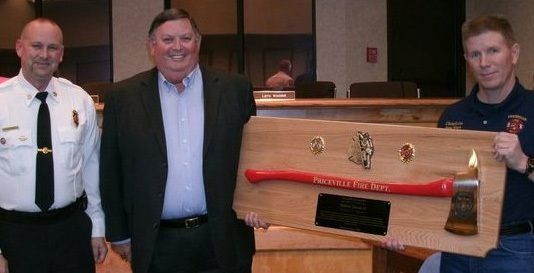 Mayor Duran was presented with a special recognition award for his lifetime of service to the community of Priceville as a member of the Priceville Volunteer Fire Department for 30+ years.— Pictured from left to right are Assistant Chief Clayton Hensley, Mayor Melvin Duran Jr, and Chaplain Steve Wilson.